As Bunker Hill developed from a fashionable Victorian neighborhood to an area of somewhat slummy dwellings, the grand mansions of the earlier era adapted with the times. In most cases, the large homes were converted into multi resident housing, sometimes a mere decade or two after construction. However, there are rare cases of Bunker Hill homes being inhabited by one family from the beginning to the bitter end, as was the case with the Larronde home at 237 North Hope Street. The Sanborn Fire Insurance maps show the house on Hope Street as being under construction in 1888. The Larronde Bunch moved in shortly thereafter and held gatherings on a regular basis that made the society pages. Unlike many residences of Bunker Hill, the Larronde home suffered no scandals or controversies. Pierre the pioneer died in 1896, around the age of 70, and Juana resided on Hope Street until her death in 1920 at the ripe old age of 84. Of the six Larronde/Etchemendy children, only two ventured off of Hope Street. Pedro Domingo would become a principal in the Franco American Baking Company and Antoinette married James J. Watson and had three children. John served as the head of the Fire Commission for a number of years and lived at 237 N. Hope Street until his death in 1954. The three Etchemendy girls also lived in the mansion for decades. Madeleine died shortly after her stepbrother in 1954, and Caroline and Mariana would live on for another decade. 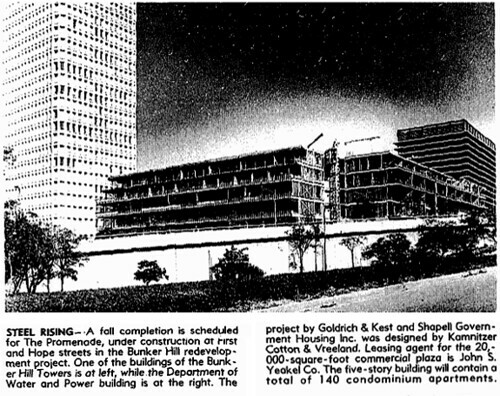 end of the 1960s, all traces of the Larronde/Etchemendy clan were erased from Bunker Hill. On May 27, 1947, Proposition B, a $12 million bond issue passed, allowing the city to sink some serious dough into its woefully inadequate parks, playgrounds, and municipal pools. One of the first neighborhoods slated to get a new playground and community recreation center was Bunker Hill, with a site at the corner of 2nd and Hope, just over half an acre, selected and purchased by the City. After a November 14, 1949 groundbreaking, the $121,646 modern recreation facility was dedicated on August 21, 1950. In addition to grounds with a wading pool, basketball courts, and playground equipment, the nearly 9000-square foot recreation hall featured a stage for movie screenings and theatrical productions, classrooms, a kitchen, showers, and handball courts (on the roof, no less). Sure, it’s a little institutional-looking, and sure, it could do with a little less concrete, some foliage that doesn’t look so spindly and diseased, and maybe some wood chips under the monkey bars to protect tender young heads, but still, it’s a pretty spiffing playground. And a long time coming, too. Residents of Bunker Hill had been clamoring for a neighborhood recreation area for over 25 years, lamenting the fact that children in the neighborhood lived in cramped quarters and had no place to play safely. A playground, residents said, would help alleviate the truancy, delinquency, and other youth problems in the neighborhood. But the thing was, until 1923, Bunker Hill had a very fine recreation area for children… until the City tore it down to make way for the new Central Library. "They are not permitted to play in the streets, and as most of them live in rented houses without grounds there is no provision for any sort of recreation, or for the care of these children. Many of the parents are working people and the children are alone all day." In the 25 years without a recreation area, kind-hearted Bunker Hill residents did their best to fill in the gaps. Mr. and Mrs. Herbert Abbott of 220 S. Bunker Hill Avenue organized beach outings, holiday parties and free movies for hundreds of children in the neighborhood, while Mrs. Pearl Alcantara founded the Children’s Community Garden in a vacant lot at California and Grand, after her son was killed by a car while playing in the street. About 50 boys and girls helped her to clear the lot of trash and rocks (although some adult neighbors who weren’t keen on the idea would scatter more trash and rocks at night). 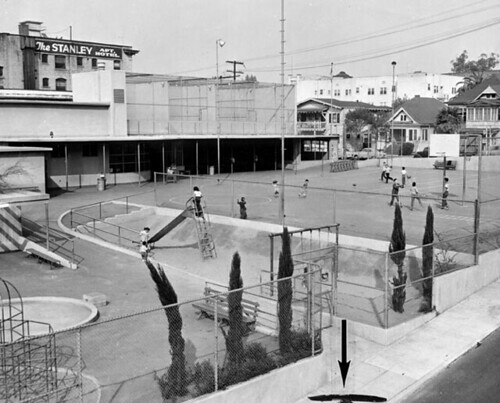 During the 12 years that the Bunker Hill Playground served the neighborhood, its facilities were tremendously popular, and its programs well-attended. However, it wouldn’t last long. In 1962, the Department of Parks and Recreation recommended sale of the playground and recreation center to the CRA for $325,000. 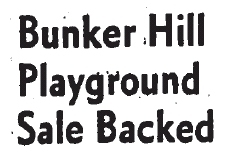 Within a year, the City Council would approve the sale, cash the check, and soon, the playground was just another Bunker Hill ghost. The Hotel Elmar — 235 South Hope St. There was a place, once, a place people called home—the Hotel Elmar. Not much of a place, 230 rooms, built in 1926, facing a retaining wall, small matter of a 1953 shotgun holdup you’ll read about, sure—but you see, it was the people that made the Hotel Elmar what it was. The Hot L Baltimore of its day. Of its dope-addled, nudie pinup, shotgun-toting Postwar day. Let’s meet some of them now. February 21, 1947. Our first resident of the Elmar, Ex-Cpl. Roy (Peewee) Lewis, 23, formerly of Joliet, Ill, is one of those war vets who came to Los Angeles. Los Angeles, the promise of the good life. You could become anyone. Your face could be up on the big screen! Plastered on billboards! Peewee at least got his plastered all over the corner of Ninth and Fedora. Lewis and his pal Paul Allen, 19, of 647 West 98th Street, were up in San Francisco a while back, where they managed to boost sixteen machine guns from the San Francisco Armory. Back in Los Angeles, they went on a taxi driver-robbing crime spree. Then they came upon an unusually hard piece of luck. While motoring along they espied a man who’d just parked, drove by and gave him the eye a couple more times…this tickled the cop-sense of the car’s occupant, Det. Sgt. Elmer V. Jackson, of administrative vice squad. He drew his pistol and held it under his coat. Lewis approached, leveling a paratrooper’s machine gun at Jackson. “I’ll take that” were Lewis’ last words, for though he was referring to Jackson’s wallet, Jackson pushed the door open, knocking the machine gun aside, and Lewis took a service revolver blast to the face. Allen burned rubber and Jackson emptied his gun at the fleeing car. Police found an Elmar Hotel room key on Lewis’ body and they lit out for Hope Street, just in time to catch Allen leaving with his arms full of clothing. Allen—whose upper arm was grazed by one of Jackson’s bullets—said Lewis had persuaded him to commit the holdups after meeting him in a bar, and Allen had agreed since he needed the money to marry a 17 year-old girl. So much for their next planned venture, which was knocking over a store at Slauson and Vermont. November 14, 1947. Edna Grover, a raven-haired 20 year-old model, calls the Elmar home. 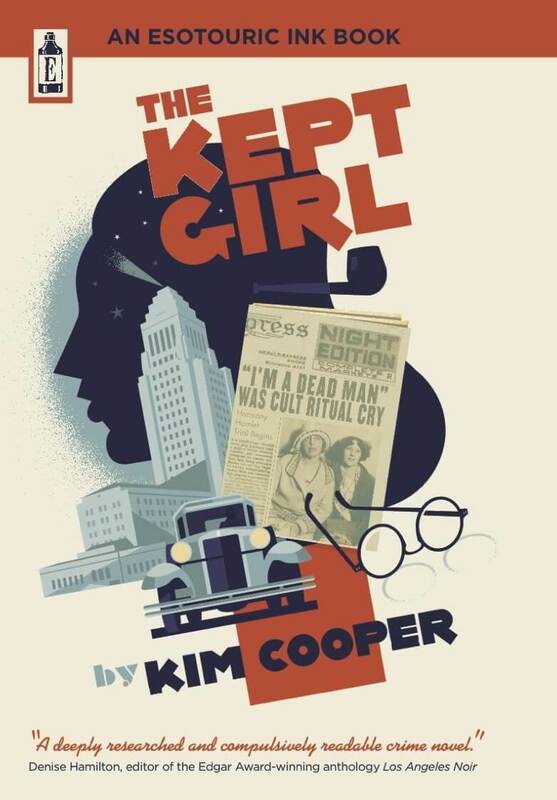 But it was at the home of photographer William Kemp, 1830 Redesdale Avenue, where investigators from the DA’s office found over 1,000 lewd photos of Edna. Kemp was fined $350 ($3,678 current USD) and given a 180-day suspended jail sentence, while our Elmarette was granted probation for her provocative posing. March 21, 1952. Martin Salas, 23, left the Elmar’s confines for an early morning spin this day. At Fifth and Main he hit a truck and injured the driver; he had an argument over right-of-way with a parked car at Sixth and Spring, and another wouldn’t get out of the way at Third and Spring, and he had a metallic argument with another parked car at Second and Spring. Undaunted, he piloted smack dab into an RKO movie shoot at Third and Figueroa (Sudden Fear? Beware, My Lovely?) where a motorist that’d tailed him flagged down a cop. The officer jerked open Salas’ door, only to have Salas step on the gas, forcing the cop to run alongside until enough cops tackled the car and forced it to stop. At some point during Mr. Salas’ wild ride he’d had a passenger who ditched in an awful (in every sense of the word) hurry—hair was found on the windshield of the passenger side. Salas was booked on felony hit-and-run. March 4, 1953. Jack Hodges is 26, an unemployed aircraft worker, and lives a stone’s throw from the top of Angels Flight at 314 South Olive. His pal Dean Coleman, 22, is in school to learn television repair, and bunks at the Elmar. When Coleman isn’t in school, the two of them visit the local hotels. With their signature sawed-off shotgun and a briefcase. The only robbery Coleman didn’t accompany Hodges on, of course, was the time Hodges robbed the night clerk of the Elmar. Coleman’s money wore thin and he’d pawned his television repair apparatuses, and went shotgun-brandishing to get the stuff out of hock. Unfortunately for Coleman, Hodges pawned a stolen wristwatch, which led police to an old mugshot of Hodges; a little police work later and Hodges was caught in a bar at Sixth and Hill, his sawed-off shotgun and briefcase found in his Olive St. hotel room closet. He gave up Coleman, who was arrested while watching television in the lobby of 235 S. Hope. July 22, 1956. Elmar resident Frank Swope, 33, took offense at fellow Bunker Hiller Harold J. McAnally, 57—McAnally lived one block west at 230 South Flower—buying a lady a drink one summer day in a bar at 822 West Third Street. So Swope walked up and pushed McAnally from his stool, whereupon McAnally landed head-first on the concrete floor. A few hours after McAnally died from his skull fracture, Swope surrendered to authorities at the Elmar. …turns out our Elmaree was in reality August Gerbitz, two years on the lam from a double murder rap in Evansville, where in December 1954 he gunned down his girlfriend, Mrs. Nadine Martin, 21, and one George Temme, 38. March 20, 1957. Salvador Perez and Jesus Cruz, both 27, had been popped by narco and were up on the fourth floor of Police Administration, having been photographed at the lab. They were walked into the hallway by officers Hernandez and Ruddell to be cuffed and led to the first-floor Central Jail for booking. That’s when both of them made a break for it. Cruz, of 4923 Gratian Street, was tackled by Ruddell right out of the gate. Perez, he of 235 South Hope, dashed down the stairway. Officer Hernandez slipped and fell, broke his ankle, but continued to give chase nevertheless. Perez ran down to the ground level and made a wrong turn toward Central Jail, turned and ran past Hernandez, but unfortunately, into the arms of Lt. Arroyo. Another vacancy at the Elmar as Perez (and his buddy Cruz) are booked by an out-of-breath, broken-ankled cop on felony violation of the State Narcotics Act. Kind of makes you want to check into 235 South Hope, doesn’t it? Perhaps you too can soak up enough of its magic to place you on this honored roll. Alas, the City has wiped Hope clean, and thereafter had it thoroughly disinfected, as one would to so much egesta on a cracked tile floor. They have left us with the most barely readable of palimpsests. Let’s take a look. 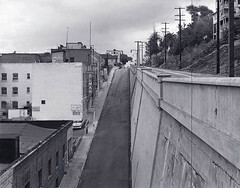 Hope Street had two levels between Second and Third; here, we are looking north toward Second, standing above the west end of the Third Street tunnel. The Elmar was midway along the block. Today, the bilevel nature of Hope Street is five decades gone. The Ghost Elmar floats roughly above an intersection made by a new street, named after a Lithuanian-Ruthenian nobleman-turned-revolutionary. I betcha Frank Swope or Edna Grover never woulda guessed. The Elmar, gone, but perhaps now a bit less forgotten. For this blog is a little like the Elmar itself. Like it says on the cigarette pack. Wherever particular people congregate.